The medieval mountain top village of Marvao is not far from the Spanish border, in eastern Portugal. This spectacular fortified village is one of Portugal’s finest, and consequently is now on the list as a candidate for becoming a World Heritage Site. It is not only the 360 degree panoramic views that make it so spectacular, but also the medieval atmosphere of its whitewashed houses and steep, narrow cobbled lanes. The best vantage point for taking in the views is on the walls or towers of the magnificent 13th century Castle. The Castle was built in 1299 by King Dinis, and although it is somewhat austere in its appearance, visitors truly feel transported back to medieval times. It is easy to imagine as you walk the ramparts, what it must have been like for the guards on watch as they looked out over the Portuguese frontier for Spanish invaders. Very near to the Castle is a small 13th century church, and here you will find a museum containing a fascinating collection of archaeological finds and local historical artefacts. As you wander through the cobbled lanes, tucked amongst the tightly clustered buildings is the Pousada Marvao (Hotel Santa Maria). The Pousada also has exceptional views from both the dining room as well as some of the bedrooms. Most importantly, it is a very friendly, charming hotel, which even caters for families by providing family games. The Serra de Sao Mamede hills are where the best chestnuts in Portugal are grown. Every November Marvao holds a Chestnut festival, and people come from all over the country to try the many chestnut dishes. The town really comes alive with street entertainers in medieval dress, traditional singing, dancing in the streets. This is also when everyone gets a chance to sample the new vintage of local wine. Only 20 km from Marvao is the walled town of Portalegre, overlooked by the ruins of a medieval castle. Because it was once the centre for tapestry production and silk weaving, it is a town filled with many magnificent Baroque merchant houses. Between Marvao and Portalegre is the Serra de Sao Mamede Natural Park with some stunning routes for serious walkers. Here you will get to see all sorts of wildlife including Europe’s largest colony of bats! There is also an opportunity to cast your eye over some Neolithic and Roman remains. Monsaraz is also another beautiful village to visit. It is extremely picturesque with only 150 residents, who work hard to protect its medieval character. For instance, there is no traffic allowed within the town walls. As you stroll through the streets you will soon be charmed by its ambience, ancient white washed houses, with outdoor staircases and wrought iron balconies. By climbing the battlements of the Castle there is a great view of the village itself, and within the Castle is rather unusual bullring that is occasionally used for bullfights. Only three kilometres north of Monsaraz is another unusual site, the Menhir de Outeiro. This Iron Age dolmen was only discovered in 1964, and is the largest in Portugal. It was once the site for many fertility rites. If outdoor pursuits interest you there are several in the area that you can take part in, such as country walks, hunting, fishing and shooting. Marvao also has its own golf course which was recently opened and is the first in the Alto Alentejo region. There is no doubt you could easily fill your day with a number of interesting sites and places to explore, not to mention all the activities to enjoy. 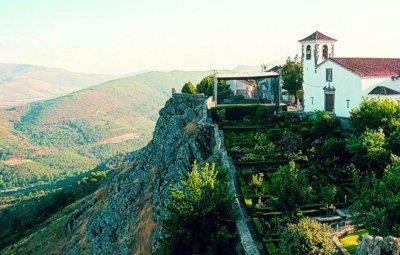 Therefore, if outdoor pursuits, wildlife and medieval history appeals to you, Marvao has it all.